I'm holding an endangered Anastasia Island Beach Mouse! Jaime has a B.S. in Conservation and Resource Studies from the University of California, Berkeley. While attending school she began working for Dr. Gordon Frankie in his urban bee lab. Here she gained experience working with native bees of California and their preferred flowers. Her work in the lab took her all over the state as she worked in home gardens, botanic gardens, arboreta and even a cemetery garden! After graduation she worked for Dr. Frankie full time and gave talks to interested groups, managed an experimental bee garden, and wrote several pieces for his website and other publications. She worked in St. Augustine as a biologist at the Guana Tolomato Matanzas National Estuarine Research Reserve (GTMNERR) for 2 years. 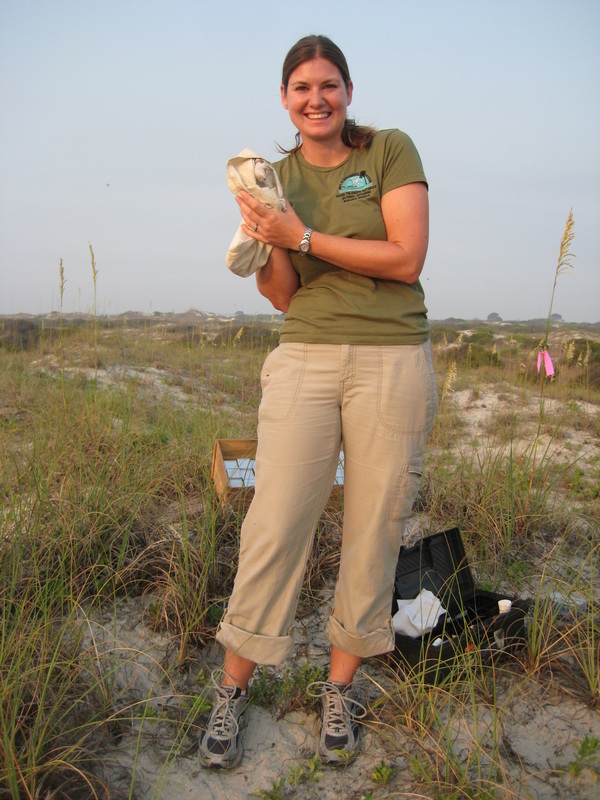 Her projects included a reserve-wide survey of native bees, Anastasia Island Beach Mouse surveys, and gopher tortoise monitoring. Jaime is now back in California working with the Urban Bee Lab at UC Berkeley again working on the urban statewide survey. Glenn Hall began keeping honey bees as a hobby in the sixth grade while living in Baton Rouge. There he worked at the USDA bee lab while in high school and while enrolled as an undergraduate at Louisiana State University. He received his Ph.D. in genetics at the University of California, Berkeley. At that time he had a small honey bee queen rearing business which helped pay his way through school. Later, Glenn studied fertilization and embryonic development using the sea urchin at Scripps Institution of Oceanography, La Jolla, and conducted research on epithelial formation using cultured mammalian cells at Lawrence Berkeley Laboratory. There he began work with the African honey bee, which was continued after he joined the faculty in the Entomology and Nematology Department, University of Florida in 1986. His research involved searching for DNA markers that distinguish African from European subspecies of honey bees (Apis mellifera) and using the markers to follow the processes involved in African bee population expansion in the New World and the extent of gene flow with the resident European bees. 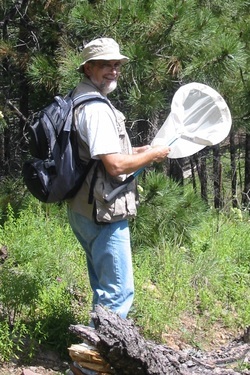 For the past seven years, Glenn has been studying the native bee fauna of north central Florida. Substantial differences have been found in the bee species composition and relative abundance in different landscapes. Discoveries have been made of rarely collected bee species, ones not reported from Florida previously, males of species for which only the female had been known, morphospecies that may prove to be new undescribed species, new floral host associations, and new cleptoparasite associations. This research has been in collaboration with Dr. John Ascher, formerly at the American Museum of Natural History (AMNH) in New York, now at the National University of Singapore. From studies of native bee nesting biology, information has been obtained about nest construction, cleptoparasite associations, and cocoon construction and structure. This work has been in collaboration with Dr. Jerry Rozen at the AMNH. Hall, H. G. 2010. The squash bee Xenoglossa kansensis Cockerell (Hymenoptera: Apidae) found in organic farms in northern Florida. J. Kansas Entomol. Soc. 83:84-88. Hall, H. G., and J. S. Ascher. 2010. Surveys of bees (Hymenoptera: Apoidea: Anthophila) in natural areas of Alachua County in north-central Florida. Florida Entomologist 93:609-629. Hall, H. G., and J. S. Ascher. 2011. Surveys of wild bees (Hymenoptera: Apoidea: Anthophila) in organic farms of Alachua County in north-central Florida. Florida Entomologist 94:539-552. Rozen, J. G., and H. G. Hall, 2011. Nesting and developmental biology of the cleptoparasitic bee Stelis ater (Anthidiini) and its host, Osmia chalybea (Osmiini) (Hymenoptera: Megachilidae). American Museum Novitates. 3707:1-38. Rozen, J. G., J. R. Rozen, and H. G. Hall. 2011. Gas diffusion rates through cocoon walls of two bee species (Hymenoptera: Megachilidae). Ann. Entomol. Soc. Amer. 104:1349-1354. Rozen, J. G. Jr., and H. G. Hall. 2012. Nesting biology and immatures of the oligolectic bee Trachusa larreae (Apoidea: Megachilidae: Anthidiini). American Museum Novitates 3765:1-24. Colla, S. R., J. S. Ascher, M. Arduser, J. Cane, M. Deyrup, S. Droege, J. Gibbs, T. Griswold, T., H. G. Hall, C. Henne, J. Neff, R. P. Jean, M. G. Rightmyer, C. Sheffield, M. Veit, and A. Wolf. 2012. Documenting persistence of most eastern North American bee species (Hymenoptera: Apoidea: Anthophila) to 1990–2009. Journal of the Kansas Entomological Society 85:14-22. Hall, H. G., and J. S. Ascher. 2013. The distinctive sandhill bee fauna (Hymenoptera:Apoidea: Anthophila) of the Ordway-Swisher Biological Station in north-central Florida. J. Kansas Entomol. Soc. In press.